The perfect pair of slippers for snuggling up the the fireplace on a chilly evening! These slippers will be sure to keep your feet snug and warm. 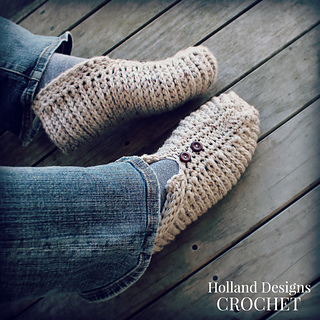 Crocheted using 2 strands of DK weight yarn held together (to create a bulky weight) and crochet hook size I (5.5.mm). You’ll also need 4 small buttons for embellishment and needle & thread. Stitches used include ch, sl st, sc, hdc, fphdc, bphdc.